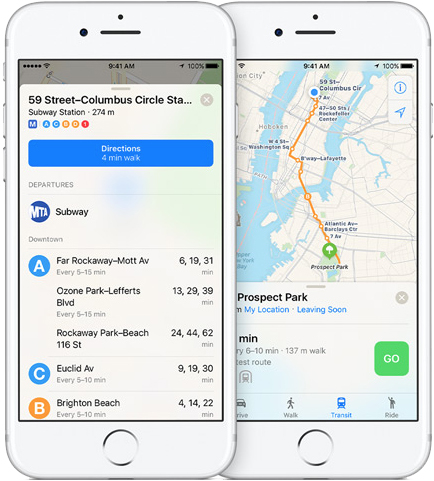 Apple Maps has had a Transit tab since iOS 9, enabling iPhone users to navigate using buses, trains, and other forms of public transportation. At launch, the feature was limited to Baltimore, Berlin, Boston, Chicago, London, Los Angeles, Mexico City, New York, Philadelphia, San Francisco, Sydney, Toronto, and over 300 cities in China. Since then, Apple has been working to expand support for public transportation to other cities around the world. Newer additions include Atlanta, Columbus, Dallas, Denver, Detroit, Honolulu, Houston, Kansas City, Manchester, Melbourne, Miami, Minneapolis–Saint Paul, Montréal, New Orleans, Portland, Pittsburgh, Prague, Rio de Janeiro, Sacramento, Salt Lake City, San Antonio, San Diego, Seattle, and Vancouver, B.C. Now, there is evidence to suggest that Apple Maps will soon support transit directions in several other cities around the world. Apple Maps typically adds station outlines to a city shortly before expanding support for transit directions to the area. MacRumors has verified that each city listed above does have at least one station outline in Apple Maps. Keuning believes that the first areas to support Transit in Apple Maps next could include Adelaide, including at least all services from Adelaide Metro and Great Southern Rail intercity service to Melbourne, and the Netherlands, including international trains to Brussel, Berlin, Frankfurt, and possibly Paris. Google Maps has offered wider support for transit directions for quite some time, but it's nice to see Apple Maps catching up with careful consideration. A complete list of cities that support Transit in Apple Maps is available on the iOS Feature Availability page of Apple's website. Great to hear. I live in a city that has full Apple Maps transit support and it's excellent. While the launch of Apple Maps was a true debacle and it still isn't as up-to-date as Google, I really like the interface and it works well where I am. It has become my map app of choice on the strength of the interface. If this the case, I also think Dubai will be included as well, after reading the article I launched the Apple map to check if the metro stations are included, and they are finally here! but the information provided by foursquare! We still don't have the navigation from apple maps, it will be great if it will work! well if they have one line for stlouis then they are done! that's the public transit we have! They've also added outlines of all the stations and ferry routes in Hong Kong very recently so pretty sure we're getting it here soon. I use Apple Maps to give me directions because I think it does a better job at correcting for traffic conditions and getting me to where I'm going. The problem with AM is that its performance varies a lot depending on the country > town > area you are in. Waze & Google do not have this problem in my experience, offering a decent "baseline" service. In iOS 9 I used AM most of the time & it was good, but in iOS 10 they took away some very useful hints, like "keep left" or "keep right" approaching big & complex junctions or high(motor)way exits, so I switched to Waze, reluctantly at first (also due to the UI cosmetics), but Waze really impressed me with the road data accuracy, POI search capability & more added bonuses. Once a month I retry Maps, check that the errors are still there, go "Bah" and go back to Waze. Just an update. Also, not sure if anyone else noticed but AM's transit map around Berlin used to extend all the way out to Poznan in Poland and doesn't anymore. For the first time, the traffic status just appeared on Apple maps, yesterday it wasn't available! This is in Dubai. How about letting us choose our own default map app to use already? ?